Lincoln City have appointed former Huddersfield boss Peter Jackson as their new manager. Jackson, 46, has signed a contract until the summer of 2009 and inherits a team bottom of League Two. "The board have backed me and now it's up to the fans to back myself and the team," said Jackson. "It's important that everyone connected with Lincoln City unites as we aim to climb the table. I'm looking forward to the challenges that lie ahead." 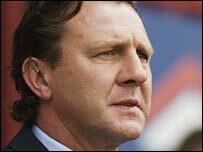 Jackson succeeds John Schofield, who was sacked along with director of football John Deehan earlier this month.